Ever wondered why no one has set foot on the Moon for decades? And why there’s no permanent outpost already established there? Is it because the Moon is not a viable celestial body to harness, or maybe because all of the above mentioned are already happening, but we are not being told about it? The answer to these questions may be easier than first anticipated, but complex at the same time. Dr. Michael Salla has pointed out that there is a military industrial extraterrestrial complex (MIEC) on the surface of our ‘natural satellite’, and there’s a strong possibility of an alien regime currently operating on the moon in tandem with humans. To support his claims and those of many others, the Chinese have released an intriguing photo of what appears to be an artificial complex operating on the lunar surface. The image represents yet another confirmation of secret operations carried out up there, and it may also reveal that the Chinese government has been in touch with otherworldly visitors. That, in turn, would also explain why China has been investing massively in radio telescopes. 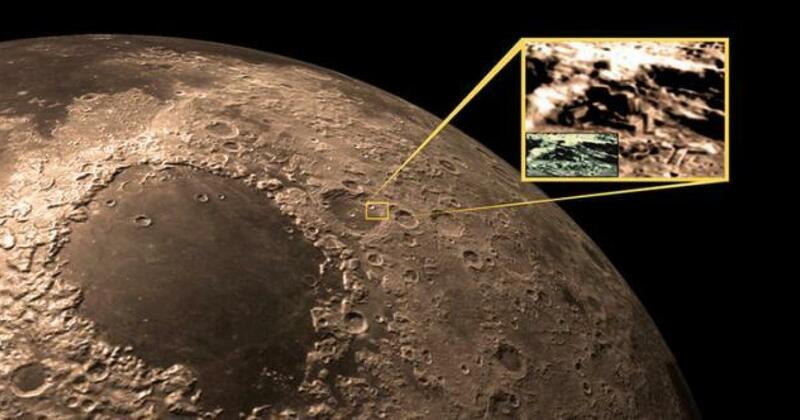 “I was sent some pictures by a source who claims China will be releasing Hi Res images taken by the Chang’e-2 moon orbiter, which clearly show buildings and structures on the moon’s surface. He also claims NASA has deliberately bombed important areas of the Moon in an effort to destroy ancient artefacts and facilities. There’s a chance that the world governments have a secret pact to exploit the moon for its minerals. This pact may be signed by other ET species residing in the Universe, which could explain why this alliance has a secretive nature. However, since greed is a common trait among humans, there shouldn’t be long until someone is excluded out of this alliance, and eventually disclose this secret project to humanity. Countless rumors speak of an alien base located on the dark side of the moon – the side we never get to see, and it’s no secret that, in 2009, NASA publicly bombed a portion of the moon for unclear reasons. Other leaked images originating from NASA’s headquarters reveal different structures found up there that are likely to be artificial in nature. Among the most renowned people to speak of this Moon conspiracy is Milton Cooper, a Naval Intelligence Officer who disclosed that the US Navy Intelligence Community knows of the alien base. The term used to describe it is “Luna,” and according to Cooper, its main objective is to mine the underground for certain materials. He also speaks of a massive mother ship found in the vicinity of the moon used by the aliens to store up materials, and also travel to Earth in small “flying saucers” found on the main ship. “LUNA: The alien base on the far side of the Moon. It was seen and filmed by the Apollo astronauts. A base, a mining operation using very large machines, and the very large alien craft describing in sightings reports as mother ships exist there,” Milton Cooper revealed. So, is it possible that what the Chinese revealed is in fact a small fraction of the mining operation facility called Luna? After all, it strongly resembles the drilling devices used by our own species, and there is no one to debunk it as being a natural formation.